Try some exotic Thai fruit! If you've ever passed by the tropical fruit stand because you weren't sure how to go about buying or preparing those exotic wonders, check out this handy resource. Includes pictures and plenty of tips on how to select, cut and prepare, and even how to cook with various Thai fruits. 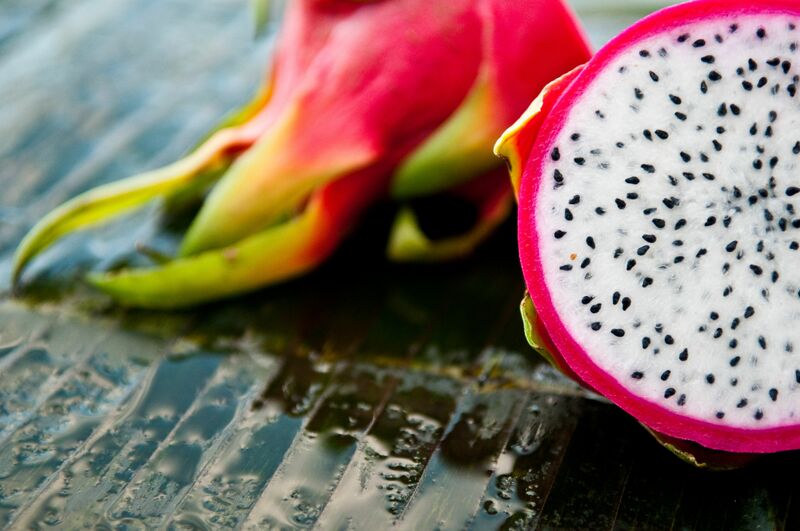 Dragon fruit is a beautiful fruit grown in Southeast-Asia, Mexico, Central and South America, and Israel. Find out more about this exotic-looking fruit, including how to prepare and eat dragon fruit, as well as how to cook with it. Also, learn nutritional information for dragon fruit then go out and get yourself one of nature's most incredibly colorful and delicious fruit! Papaya was called "Fruit of the Angels" by Christopher Columbus and for good reason. Papaya is sweet and succulent, plus it offers numerous health benefits. Full of antioxidants, flavonoids, plus loads of vitamins and minerals, this is one of the healthiest of nature's fruit! Find out how to choose a ripe papaya, plus how to cut, prepare, and cook with this most exquisite of fruits. How do you choose a mango, and how do you know if it's ripe? How do you go about cutting a mango, and what is the best way to eat it? If you've ever asked yourself any of these questions, you can easily find the answers by checking out this "All About Mangos: How to Cut a Mango" guide (with pictures). Learn more about durian fruit and how to prepare this 'king of fruit'! Learn everything you need to know about buying and preparing delicious lychee fruit. In our case, we often sit down with a bowl of lychees after dinner and enjoy them as a dessert (shelling and eating them as we go). While canned pineapple might be the quicker way to go when you're in a hurry, there's absolutely nothing that tastes as good as fresh pineapple. Learn how to buy, cut, and prepare fresh pineapple. Plus, learn how to create a pineapple "boat" with what is leftover (great for parties, especially when serving Thai pineapple fried rice, or tropical Thai fruit salad!). If you've ever been curious about star fruit, this article is for you. Find out how to cut and eat a star fruit with my step-by-step pictures and instructions. Also learn basic facts about star fruit, including the health benefits of eating or juicing star fruit. Included are shopping tips for choosing a ripe star fruit, plus star fruit recipe links... basically everything you wanted to know about star fruit in one place! This quick how-to article will tell you everything you need to know about Mangosteen fruit, including how to choose a ripe mangosteen as well as how to prepare it, plus mangosteen recipe links. Now available for the first time in the US, you'll find mangosteen to be a beautiful fruit that offers numerous health benefits in the form of antioxidants - both the fruit itself and the skin are incredibly potent disease-fighters. So find out how to prepare this incredible fruit and then go get your hands on some today! Learn more about exotic rambutans! Rambutans are a hairy-looking fruit that grows in Thailand and other Southeast-Asian countries. Jackfruit - What is Jackfruit?